A year ago, I wouldn’t even think of having my own garden. Or nursery. Growing plants is just not “in it” for me. Always thought my hands aren’t green enough to grow anything. Bought several cactuses from countless trips to Cameron Highlands, and starved them to death every. Single. One. Then how am I to keep real, green plants that require special care on everyday basis?! But. The day has come – couldn’t remember exactly when, but I once we moved into our new place, all I could think of, everyday – we need plants. Pronto. The place is four white walls facing each other, with only neutral colored furnitures – some green would definitely boost up our spirits, I thought. So I started looking. Started noticing small stores which sell indoor plants, and what price range they’re in. Started noticing others’ houses just so I have a clue on indoor plants deco and care – what types of plants are suitable for limited space, what they need for living, etc. Then..I found myself getting 3 potty plants, all green and small and innocent. And oh boy was I glad I made that decision! Brought them home, put them on our living room cabinet, sink area and our TV cabinet – they made our home looks a lot homier. They came with limited care needs too, since the soil is a special-made sponge (I don’t know what they call it) and I only need to water them every 3 days. Sounds easy, but so far 1 had died on me T.T So I bought another one, making sure it hails from the species which require minimal care and can actually live indoor. Then. I discovered other exotic plants, and came across Monstera. 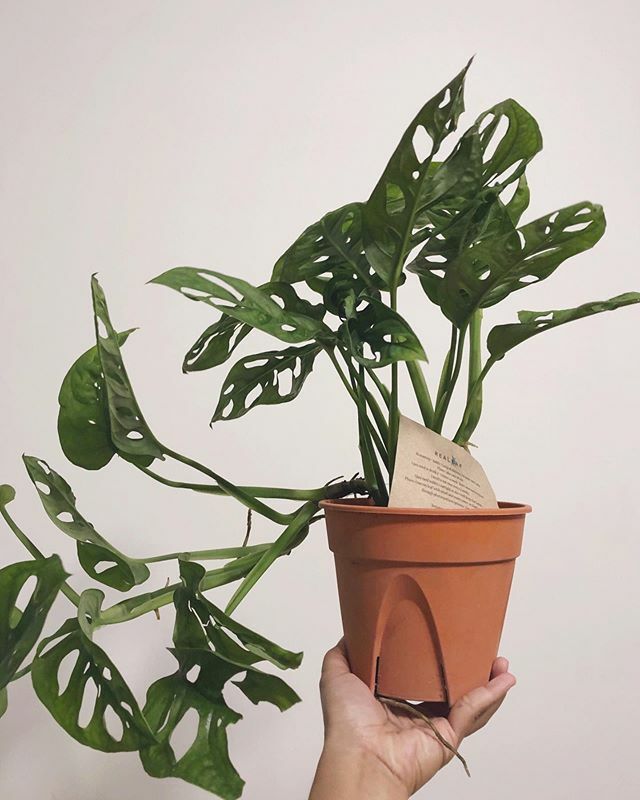 If you’re not familiar, this is how Monstera looks like. It has unique shape of leaves, hence the many inspirations in design and architecture using its signature leaf shape – once, I couldn’t sleep thinking about that Monstera printed pillow cover, but couldn’t bring my heart to purchase since we already have our own pillow cases. Then a friend told me that she has a friend who sells real plants, one of them – the Monstera plant. Quickly looked at their Instagram account, contacted the founder, asked her about the availability and…. Guys, meet my little monster. I am beyond happy. Look at the pretty, pretty leaves..
Is this how love feels like? My little monster, I promise I will take care of you as good as I can. Just please, please don’t die on me. This year feels horribly fast. Horrible because you would somehow feel how much time has passed just by looking at your kids. And now it's Raya already! OK. So those few sentences was from wayyy back - just a few days after Raya, when I sheepishly thought I finally had some time to write here, before two small kiddos decided to come and drag my arms everywhere. What's been up in my life? Well I have been at more places than I should be, hence the silence on this space. Been back and forth between KL and a small city in Perak i.e. Tronoh for my project, and then back and forth again for my Master's, and then back in KL for good again - hopefully that stays longer. Can't imagine having to leave my boys again. Sob. Quite busy, but still found some time to update my Instagram story lol. Oh I love this Instagram story thing - probably the only social media hype that worth the attention, IMO. Am back in KL, but still swamped with work, still have to look after and feed the kids, and a household to maintain - oh, we finally moved! Am yet to show you the new place but let's wait until it's completely done - my ID skills are nowhere near Insta-worthy. Oh, also if you're following me on Instagram, you'd notice this. I have a newfound love for instant, pinless tudung. I KNOW RIGHT?! Never in a million years would I have even thought.. But hey, sometimes change is good. Let's see if it sticks. "You wear skirts a lot nowadays"
Which I think is much to his approval, because skirts don't 1) show your bumbum 2) hence, more modest 3) means less jeans for me! And yes, the shopping spree for skirts means less money in purse too lololol. But what to do, a girl's gotta grow up and woman up, right? A lot of people say I look more ladylike in skirts. This particular skirt, especially, because of the volume it gives - and got it at such an affordable price too! I love that it feels free-r to move around, twirl, or chase after the boys in skirts. This voluminous skirts, especially because other skirts are just too tight for ma legs to run around. Next on the shopping list? Pleated skirts. Am hunting high and low for affordable and pretty pieces, so if you know where to get, let me know! Just some anecdotes we've been getting from Rayyan lately. Since he's turned 3 years old, it seems like his vocab and speaking skills have increased tremendously. And unfortunately..so does his excuses. Every night before going to bed, Shahrul would ask Rayyan to clean up and organize his toys which would at this point, be sprawling across our living room i.e. in front of the TV. We have a container box and Rayyan understands that he needs to put back all his toys inside the box at the end of the day. So usually, usuallyyy when he's in an okay mood, he would oblige. Sometimes, we would need to bribe him with something if he refused. Sometimes, Shahrul would threaten to take away something he values if he refused to do it. Daddy : Rayyan, kemas toys please. Letak dalam box. Complete with clutching his tummy, pretending to be really hurt. We know for a fact that he's not "sakit perut" at all, and that he was just pretending - but it's the first time that he's bold enough to LIE AT OUR FACES. I didn't remember how we settled it or how we confronted him, but I think eventually after Daddy's nagging he reluctantly kemas his toys back into the box. Similar case to above, but less bold. Daddy : Rayyan, kemas toys now. Daddy says afterwards that he heard Rayyan but he ignored it, and Rayyan, realizing that his excuse didn't work, continued half-heartedly kemas his toys. Dah pandai bagi alasan dekat Tokmi sekarang ya!!! Oh well. Guess someone's gonna need intervention on his (lame) excuses soon. Some months ago, I received an email – a natural, organic shampoo product offer for me to try and evaluate and share my thoughts on it. It was at the same time, when I was having a major breakdown due to the ridiculous amount of hair I found on my floor every single day. Just the night before, I was having a mental breakdown i.e. cursing my husband in my head because he had the guts to tell me “your hair is all over the place, why don’t you clean it now” and “how come I’ve just vacuumed last weekend and today there’s a segerombolan of your hair on the floor”. You know, something along those lines, only maybe nicer. I was denying it but the next day, I thought better of it when I came across some hair accumulated behind my bedroom..maybe this husband of mine was right. Then I read online. True enough – mothers who had just given birth would experience ridiculous hair loss due to imbalanced hormones and also because the body trying to get to its original nature, pre-pregnancy. This conclusion was drawn because you know how during pregnancy, mothers are said to have this “glow” – better skin, better hair?? Well, it’s no miracle. It’s actually because of hormones – pregnancy makes your skin better and makes your hair shine brighter than usual. And hair loss would be at much, much less rate too. So that’s why some 6 months after pregnancy, it’s the body trying to shed off these effects and coming to its original state (hence the more hair loss than usual) and mothers are told not to worry about it. Well, in my case, it sure is. 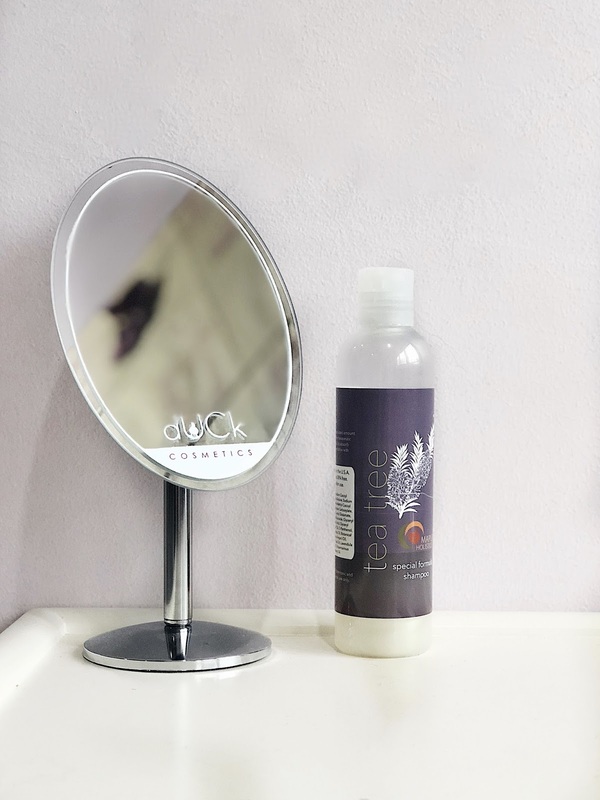 I couldn’t wait any longer so I tried this Tea Tree Oil Shampoo from Maple Holistics – to see if it would somehow work miracle on me.